Nico Rosberg edged out Mercedes team-mate Lewis Hamilton to set the pace in Belgian Grand Prix first practice. Hamilton seemed to be struggling with aspects of his car, missing a couple of braking points and running wide twice at the 150mph Pouhon double-left. Hamilton also had to rescue a slide at the 180mph-plus Eau Rouge sweeps. Ferrari's Fernando Alonso was third fastest, 0.228 seconds behind Rosberg. As the season resumes after a four-week summer break, the Mercedes drivers face the latest instalment in their increasingly fractious title battle on one of the sport's greatest tracks. The two have discussed with their team the fall-out following the controversial last race in Hungary, when Hamilton refused an order to let Rosberg by to enable the German to maximise his different strategy. The team have reassured Hamilton he did nothing wrong, and Rosberg says he has "learned some lessons" from the incident. Their tussle began immediately in Belgium, with Rosberg setting the initial pace, and grabbing back first place immediately after Hamilton edged ahead. Alonso had earlier also briefly occupied top spot before himself being displaced by Rosberg. But Ferrari are not expected to maintain that position behind Mercedes for the rest of the weekend. Alonso has spoken of this weekend and the next one at high-speed Monza in Italy as "damage limitation" in their battle for third place in the constructors' championship with Williams, who are expected to excel in the two races. Their drivers Valtteri Bottas and Felipe Massa were only 10th and 14th in first practice, when times are not necessarily comparable because teams run their cars in different specifications. Ferrari have tended this season to appear more competitive in first practice than they end up being for the rest of the race weekend, almost certainly because they run the session with less fuel in their car than most. Despite Alonso's pace, Ferrari had a difficult session. The Spaniard briefly stopped at Eau Rouge as a result of a concern over his engine before resuming, and Raikkonen's front brakes were changed after he expressed dissatisfaction with their feel. McLaren's Jenson Button was fourth, a further 0.6secs adrift and ahead of Ferrari's Kimi Raikkonen - a second behind Alonso - and Force India's Sergio Perez. McLaren's Kevin Magnussen was seventh, ahead of Force India's Nico Hulkenberg, Red Bull's Daniel Ricciardo, Williams's Valtteri Bottas and the second Red Bull of world champion Sebastian Vettel. At the back of the grid, Marussia have come to an agreement that will see Max Chilton back in the car for second practice after saying on Thursday that he would be replaced by reserve driver Alexander Rossi as a result of contractual problems. The American drove in first practice, but the team resolved their difficulties with Chilton and he will take over the car for the rest of the weekend. Rossi was 1.5 seconds adrift of team-mate Jules Bianchi on his first experience of the Marussia. Caterham's new driver Andre Lotterer, who is replacing Kamui Kobayashi on a one-off basis for this weekend, impressed by edging team-mate Marcus Ericsson by just under 0.1secs in his first session with the team. 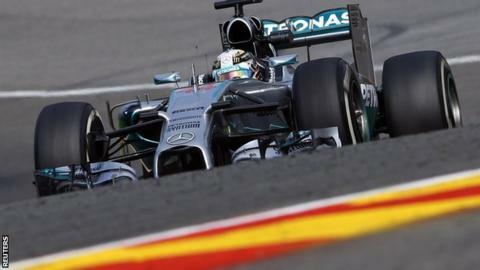 This weekend's Belgian Grand Prix is live across BBC TV, radio and online. Read more on Lewis Hamilton and Nico Rosberg: Who will win F1 championship?